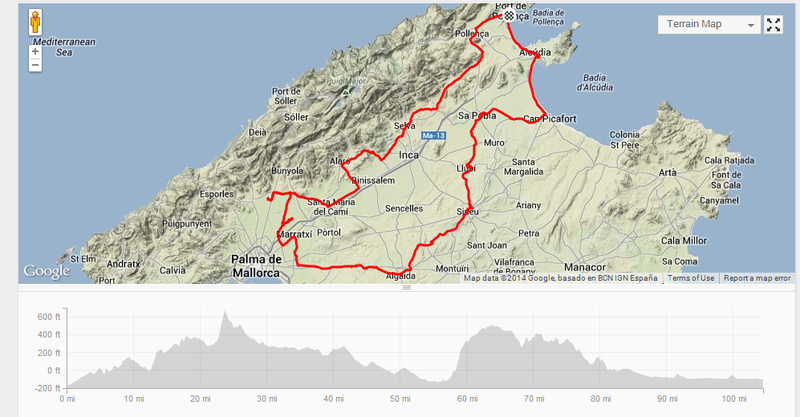 Riding in Majorca, 2014 – Ride. Write. Repeat. 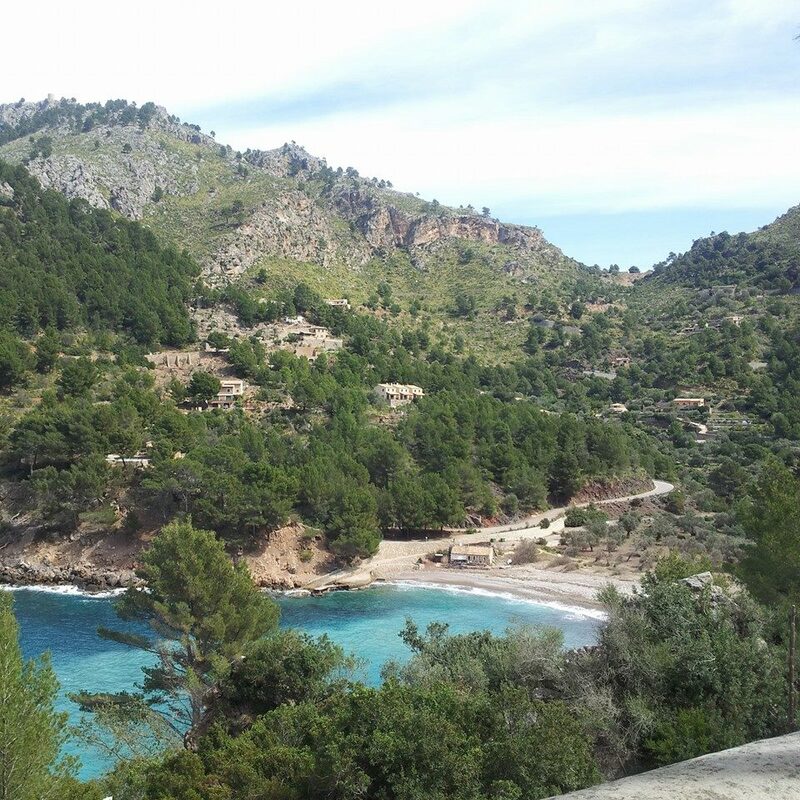 My 4th trip to Majorca was by far my best. I felt a lot more confident at departure, anyway – I’ve been out to the island a few times now, so there was less of that nail-biting concern that a few first timers told me they were going through. I knew we’d ride long, I knew we’d ride up hills – and I knew that I could only ride as hard or as fast as I’m capable. 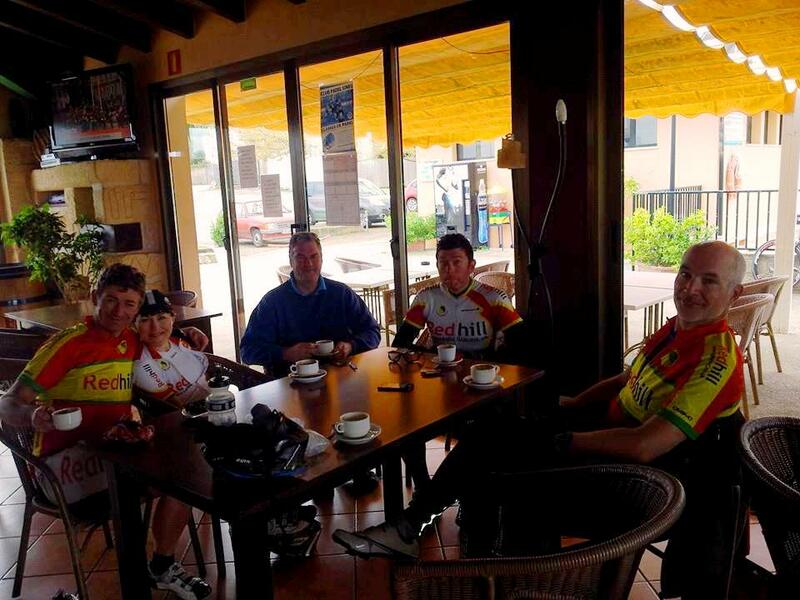 The other big difference was the number of companions – 87 Redhill CC members made the pilgrimage to the land of smooth roads and mountains this year, and of 87 riders, I was fairly confident I’d always find a group to ride with, even when the majority went home after day 4. Finally – I ate a lot more this year. Previous years I’ve been fearful of the famed “Majorca KG” – and I’ve tried to limit my buffet dinner to one plate and fruit. For lunch, Lisa and I have always made rolls from breakfast and snuck them into our back pockets – both free and bite sized! I’ve always returned home lighter or the same weight as leaving, but I’ve also found myself getting more and more fatigued through the week. This year, I ate like the hungry caterpillar. On returning on Wednesday, I was admittedly nearly 1kg heavier than when I left, but amusingly in the 2 days following, I’ve lost 0.7kg of this, so I’m not too distraught – and I think the extra food meant better rides. Oh – and my saddle! 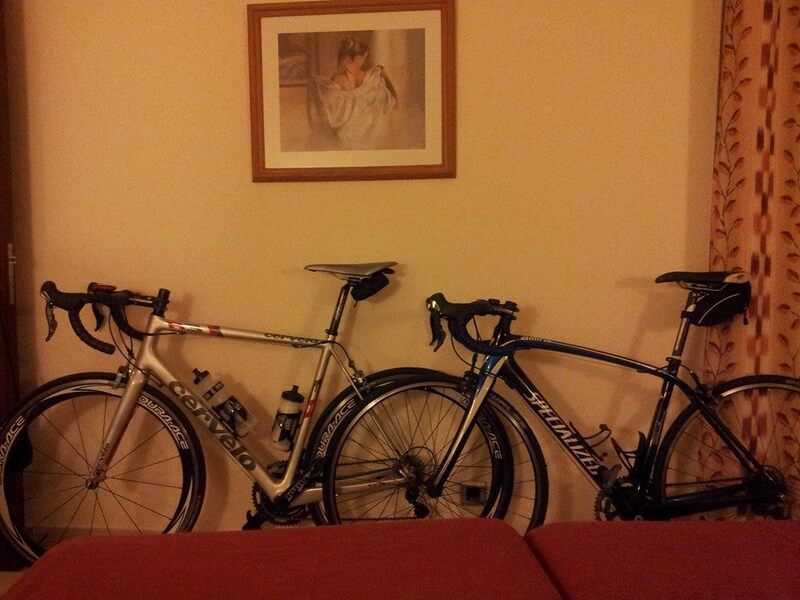 I took my Adamo this year – and pretty much had no saddle discomfort at all. Compared to previous years, this made a huge difference. The oh-so-common mistake made by training camp/cycling holiday riders is to go out on full gas on day 1, leaving nothing in the legs for the following days. You know what? I totally did it this year – and I’m not even a tiny bit sorry. Climb number one was my favourite – 8k to the top, followed by a further 8k of mostly up, and a couple of ski-slope downs. The petrol station climb, as it’s affectionately known, is a favourite among many – it’s so close to the hotel it’s repeated frequently. At the foot of the climb, I watched a cluster of riders go ahead of me, hung on for about half a mile, then dropped off. 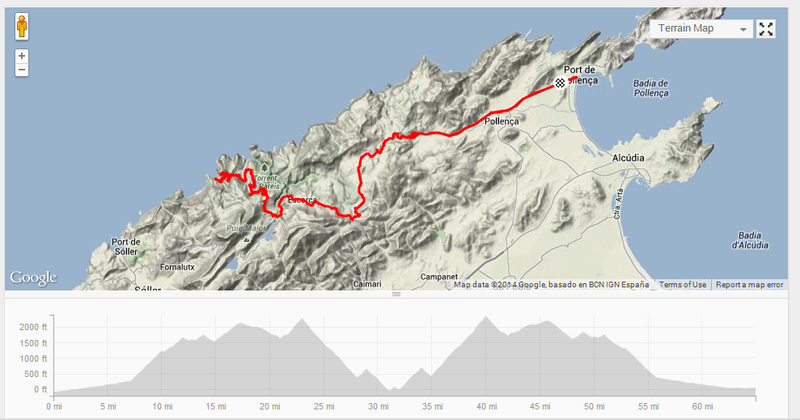 However, switchbacks mean you can follow your progress, and around 2.5miles in I clocked that I was closing the gap. To cut the story short, I nipped past a few riders towards the end, reaching the petrol station (admittedly minutes!) after prolific climbers Nathan and Cara, just behind fellow TT powerhouse Jonny – with my heart rate at 192bpm. My max is just over 200 so far as I know, but that’s not the best way to start a 100 mile ride. I’ll let you into a secret – before this ride I’d never technically ridden over 100 miles. I’ve ridden 98, 97 etc – but genuinely never seen 100.00miles on a Garmin or Joule screen. The G5 pace of Peter Farnfield, Stuart Bunt, Lisa (my Majorca buddy for 3 years running now) and the rear wheel of Johnny Bradbourne made it fairly fast thrashfest fast, too. Day 2 was absolutely hilarious and painful on so many intricate levels. G4 joined with G5 – mainly my own doing, as the little band of 3 members of G5 were requesting my company to up the numbers, so in telling G4 this would be the case, I took the entire group with me – what can I say – popular. Hilarity ensued. Arguments over pace, a few comments about the rolling section along the not-so-picturesque motorway- and a lot of random accelerations resulting in the need to put the hammer down just to not get dropped. At miles 80-100, where everyone knows their way home, the faster riders clearly wanted to thrash it home, and it became a battle to hold on. And I did. Despite the heartbreaking moment where Johnny and I just made it to the front group, only to be stopped by a car at a roundabout, causing us to have to start the chase all over again. We testers stick together, though, and I mainly stuck to his wheel. 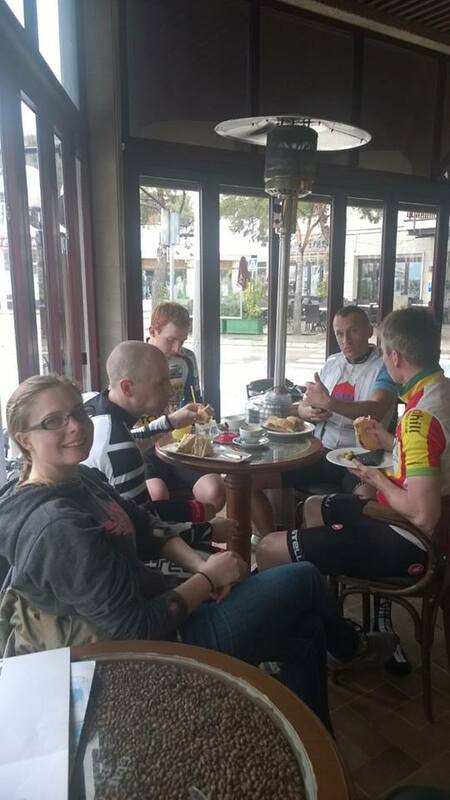 Miles 100-110 were a little more sedate, save for one failed attack by an individual-who-shall-not-be-named at around 105 miles, once everyone had accepted the neutralised zone of “nearly at Tolos bar”. My longest ever ride, with a fair few sections well over threshold (and a few miles missing where I started my Garmin late): Here it is. It rained. 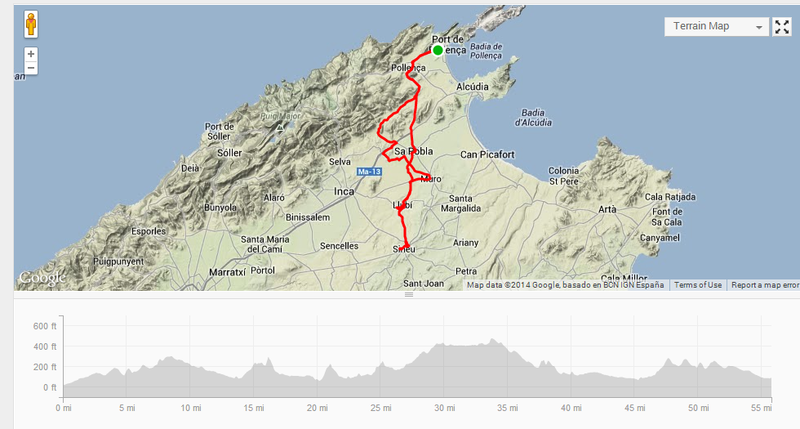 Plan was Sa Calobra, but at the top of the Lluc climb it hammered it down, so 3 of 6 of us rolled back down the mountain. Day 4 is usually recovery day, but we swapped it over. Day 4 – Windy. Petra was in there somewhere. Mainly just wind. A small band of G5’s (me, Lisa, Stuart, Cara, Peter) averaged about 19mph towards Petra – I had my angry legs on and I put in a few little attacks on my way out, smashing up some of the short power climbs that I love so much. About 20minutes later I found myself dropping off on the long, steady climb up to Petra, but it was almost fun enough to be worth it. Thankfully, we congregated with G4 along the way, so we had a nice bunch to Petra. From Petra, myself, Johnny, Peter F, Stuart Bunt and Lisa turned towards Inca, and the headwind began. The way to lunch was a crawl, and at one point I noticed I was doing about 230 watts to go downhill, at 13mph, sitting on Peter’s wheel. We all took our turns, and I think that camaraderie meant we got home without anyone seriously descending into bonk-hood (what happens when someone just can’t pedal anymore). It was interesting to see the effect the battering had on the entire gang after dinner – where usually the lively dinner hall might include a few 1,000 yard stares, the windy day seemed to transform almost everyone into an eating/sleeping zombie. Good training, none the less..
Much of the group left us after day 4, to return home. A tiny bit of me was a tad jealous as they piled into the coach, but then I took a walk down to the town and remembered why I love Majorca so much, and my mood soon swung to “don’t want to go home”. 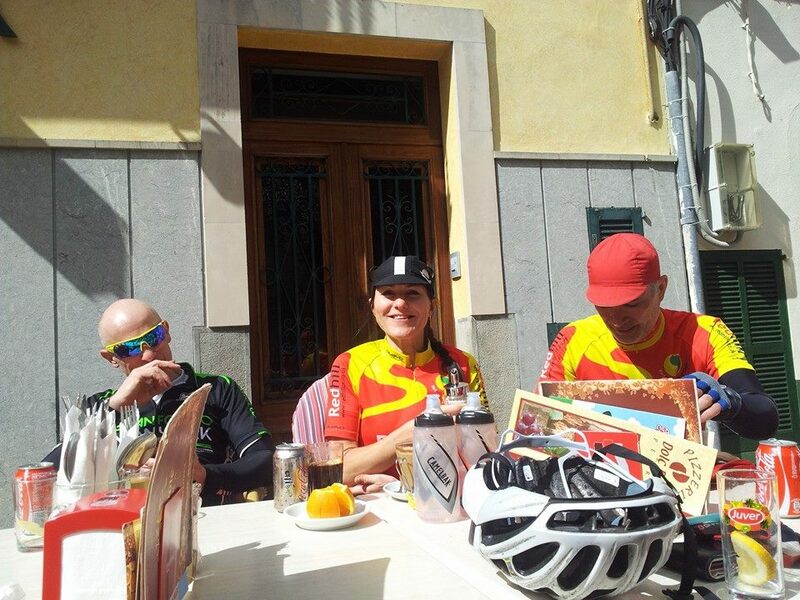 A small and select group took on the Sa Calobra ride on day 5. My legs were pretty much knackered, and having left Maurice in the apartment having a recovery day, I was tempted to turn round and join him a few miles in. However, with just me, Peter, and Lisa – that didn’t seem hugely fair, and the forecast for the following day looked dicey. 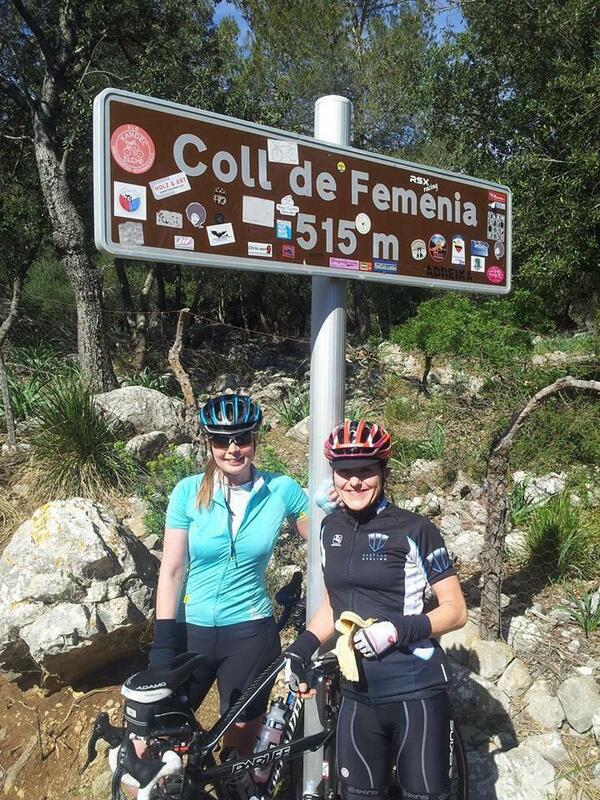 I first met Lisa (I think) on Majorca trip number one, where I think I’d only been riding a bike around a year (I’m still a relative newbie with 4 years under my belt). She’s unbelievably strong on long rides, I don’t know how she does it. 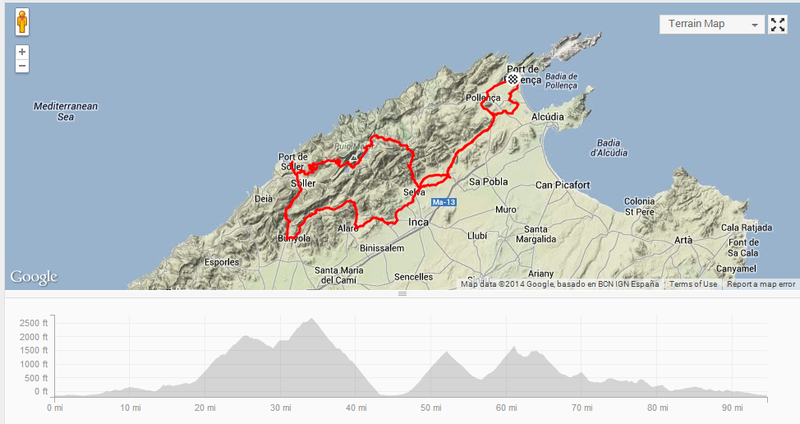 Sa Calobra itself is a beautiful climb – a 10k climb that ramps up at the end, presenting the rider with a great view of the myriad of switchbacks they have yet to attack. 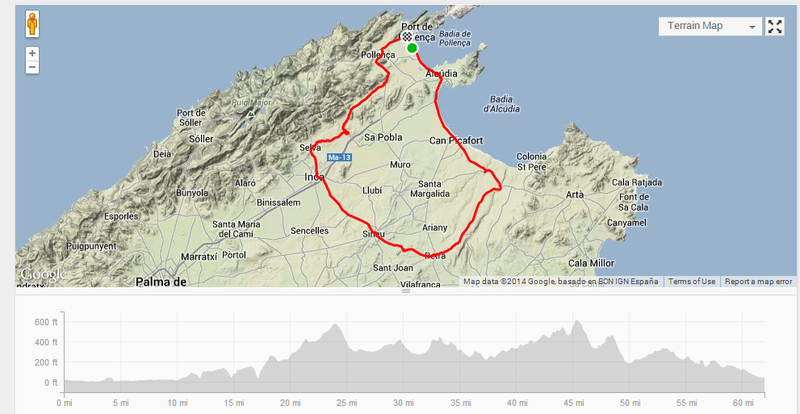 The problem with Sa Calobra, is you have to climb most of the way there. By the time we reached the bottom, I was pretty exhausted – except we didn’t go to the bottom. We turned off left, at Peter’s suggestion, about 1 mile before the bottom, with the plan of lunching at the adjacent bay. What I wasn’t expecting was another 3 miles of climbing to get to this fabled lunch spot. I’ll admit – it was a beautiful spot for lunch, but I think my handlebars might have suffered some abuse on the way there. It was a hot day and I think I was probably becoming a tad bit of a whinge (sorry!). Lunch was lovely, and we made it to the top, then to home, all together. Once we were back out of the mountains, I seemed to find all my energy again, and enjoyed a mad sprint along the road back to the hotel with my buddy Lisa, as we attacked and picked off a few red faced looking blokes on the way. Having suffered the previous day, I’d done what I always do – and followed Lisa in a step up to a faster group of combined G5/G6. The G6 members were having an “easy day” as some of their chums took the day off, or joined slower groups. This select little gathering included Peter F, Lisa, Me, Brian Costello, and Leeson. We smashed it out round the country lanes, and rode out around 30 miles to Sinue – where there is an outdoor velodrome. Brian and I enjoyed a couple of laps, whilst Leeson, who really should be a track rider enjoyed the opportunity to play some games, trackstanding at the banking and chasing PBs on the straights. We’d planned an easy ride, but a few ramps on the way out saw me pushing just under 400 watts, and the headwind in our faces meant it was never going to be easy. The last 10 miles of incessantly rolling road saw me hitting around 300 watts at the peak of each, which since my FTP is just over 200 seemed good enough. Well – I drank some Gin. And some Jagermeister. Got back to the hotel, at some point. I’m not allowed to tell you any more, or I’d have to kill you..
Epic journey(s), you certainly put the miles in. Nice little Sa Calabra secret food tip too. I can almost feel the sun on my back… Never heard of the Mallorca 1kg before but can definitely see how this happens if you buffet it every night. I only went for one buffet but I must have eaten at least five portions of pork suckling! Happy recovering! The weight gain – rapid loss is due to the body adapting. 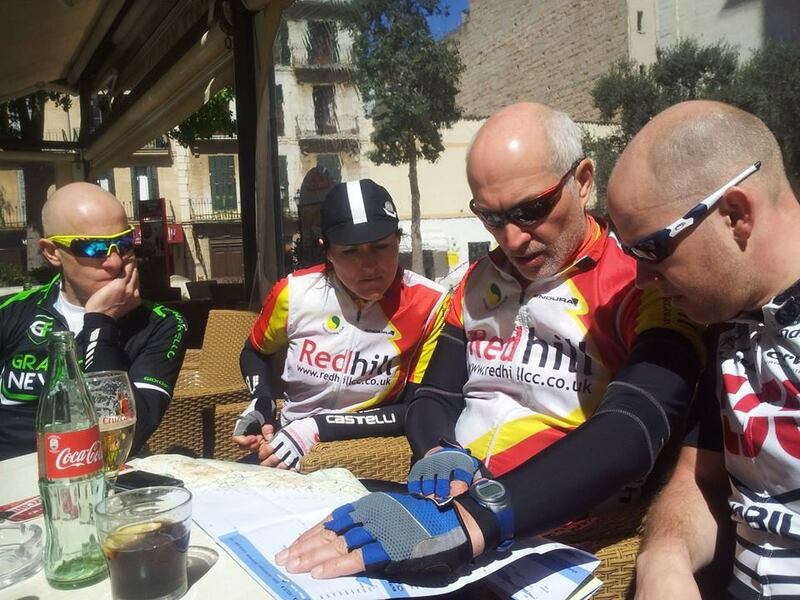 If you ride hard for a few days, as on a cycling break to Majorca, the body realises that it needs to be optimally prepared, and assumes it will need to do the same the day after etc. Therefore, it stores as much glycogen and water in the muscles as it possibly can, ready to use energy. This can lead to gains of up to a few kg, which usually equalise after a day or two. Great site by the way, glad I stumbled upon it! Happy riding! I did not know that! Thanks for the info!